Castor oil has gained so much popularity recently, mainly for its hair growing benefits. It has, in fact, got a glamorous status in natural hair care. When I was growing up in India, castor plant was just another roadside plant. It didn’t get any admiration. Although it was used for hair, but then the most popular oils for hair were coconut oil, almond oil, sesame oil and mustard oil. Also that time women’s and men’s hair just grew without any extra effort. I guess it was because of healthy, non-processed, low-sugar diet, fresh air and more physical activity. Coming back to castor oil, it has remarkable healing properties and has been used to treat many health issues such as joint pain, ligament or muscles sprain, skin conditions, stomach problems, and so on. Its ability to heal the scalp and nourish the hair follicles is what makes this oil so beneficial for hair growth. Castor oil can also help prevent and remedy hair loss and make hair stronger, thicker and shinier. Castor oil contains a unique ingredient called Ricinoleic acid– this is the star ingredient of the oil and what makes the oil thick and sticky. It offers great healing benefits thanks to its antibacterial, analgesic and antifungal effects. A regular massage with castor oil will help to clear up dandruff and other scalp conditions quickly. The good thing about castor oil is that it doesn’t clog the pores; in fact, it unclogs the pores and removes the dirt and grease which is sitting inside the hair follicles, making it cleansing oil for your scalp. Also, castor oil speeds up the removal of toxins from the scalp that could potentially damage hair and slow growth. Castor oil has omega 9 and omega 6 fatty acids, both of which nourish the hair follicles, and aid in repair and renewal of hair cells. So the new hair that grows out is stronger, healthier and more resilient. Besides, castor oil is a superb moisturiser. It has a special ability to draw moisture from the air into your hair. This is especially useful if your hair is dry and damaged. It will lock the moisture in your hair, and condition it to give you smooth, glossy, beautiful hair. Castor oil also contains antioxidant and anti-inflammatory properties. So it not only supports keratin in hair but also protects the hair from damage and thinning. 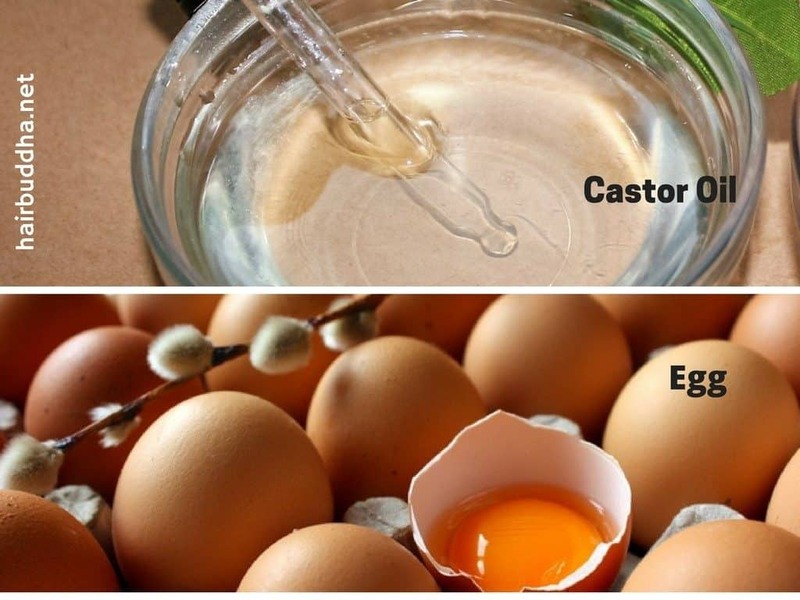 Castor oil works superbly well with egg. Rich in proteins, vitamins, and super-nourishing fats, eggs not only make your hair softer, shinier and healthier they help you to grow it long as well. An abundance of vitamins A, D, E, B12, biotin (often touted as the ‘hair growth vitamin’), iodine, selenium, and pantothenic acid will help prevent any hair loss and thicken thinning hair. While vitamin D and B12 promote new growth and amino acids keep split ends at bay. 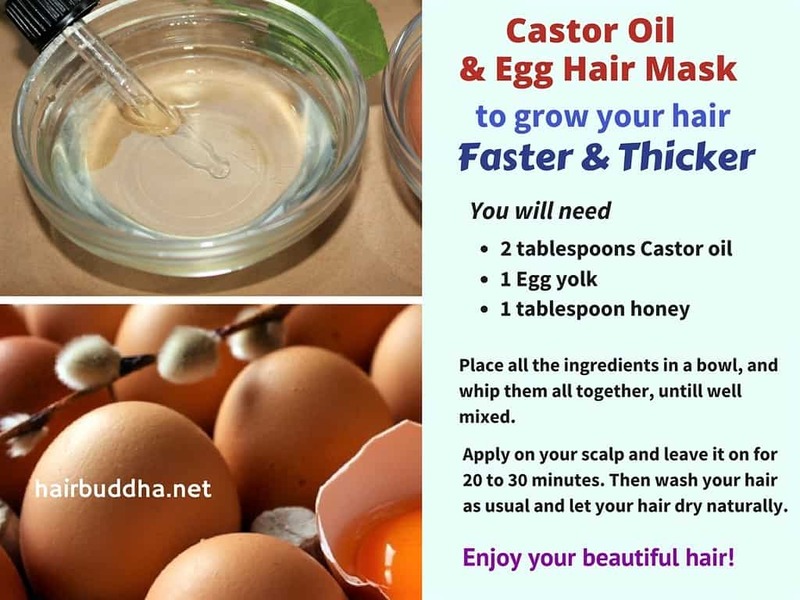 Place the castor oil, egg, and honey in a bowl and whip them all together until well combined. Add some water if you think this mixture is too thick to apply. This hair mask is enough for shoulder length hair, if you have longer hair double or triple the quantity. Massage the mixture into your scalp and hair. Cover your hair with a shower cap or you can wrap a cloth around your head, and leave it on for 30 to 60 minutes. Next, wash your hair with a natural shampoo such as this and let your hair dry naturally. You can also use homemade shampoos such as this and this. Do this mask once a week to restore and maintain your hair. Buying Castor oil: Which is Best for Hair? Pure castor oil is pale yellow in colour and doesn’t have any smell. When you buy castor oil, look for one that is cold pressed, unrefined and hexane free. Such type of oil will be rich in nutrients and free from any artificial chemicals. Cold pressed means that oil is extracted at low temperature, without the use of heat. This way the oil retains most of the nutrients, while heat extraction can destroy a lot of goodness of the oil. And unrefined means that the oil is not bleached to obtain a uniform looking oil with no colour or smell variations every time you buy. You can Buy cold pressed, unrefined Castor oil here. Jamaican Black Castor Oil: Black castor oil is obtained after roasting the castor beans. Thus this oil has a darker colour and slightly smoky smell. This oil is said to offer more moisturising benefits, so it will be more suitable for people with dry, coarse hair. You can buy black castor oil here. Do you use castor oil on your hair? Ever tried it with an egg? Share below! Hi Deepika, please do. Let me know how it works for you. Can I use the whole egg with castor oil or just the yolk is to be used? I have very oily scalp but dry damaged hairs at the end. Yes you can use the whole egg. But I like just the yolk and that’s why the above recipe. How long before you can see results? how fast acting is this hair mask? my hair started thinning after I had my kids, I found this mask and I wanted to try it I have done it 3 times now and at first my hair was looking nice but I noticed after the third time it is getting very dry. I put the mask on for an hour with a shower cap can you recommend anything to help? Love this mask! It made my hair thick and new baby hairs growing. I found that mask the best one. And habas mask also vary good. Can i use it every day? You can use castor oil mask once a week and black seed mask once a week. Hey I was just wondering if I could skip the honey ingredients? For the castor oil, honey, and egg mask, can I leave it in overnight and wash it the next morning? No, wash after an hour. Hi. Do i have to wet my hair first before i put this mask or just dry hair and put mask? You can apply on dry hair. Love your blog. Are all these Ayurveda remedies from a specialist? Can you please suggest a home made remedy for split ends on top of the head for dry, frizzy and wavy hair? Do you over style your hair using heat? To prevent further split ends use one of these masks weekly. No..never styled them.During my last trip to India the hair stylist did use a heating iron without my consent and it made my hair even worse. Use this castor oil mask and other masks that I have suggested. It will definitely help. Hi. I found that my hair was breaking a lot, so i started using Argan Oil. while using this for 2 weeks i noticed i start having some fungus in my scalp it is really bad i tried using anit- biotics for it but it doesn’t seem any better. It is very painful and smelly. I really want this to end so i am asking what do you recommend me to use to get rid of this. Thank you. hoping for a favorable reply. Was it pure argan oil? You don’t take antibiotics for fungal infection. I suggest you visit your doctor to see what is wrong. Can I use coconut oil or almond oil instead of olive oil? Can I leave it out in room temperature or do I have to leave it in the fridge? If I have to leave it in the fridge then can I warm it up a bit to knock the cold off? Please make fresh for every use. In my area black castor oil is not available. .I am using dabur castor oil. .does it work in the same way? ? Is it helping your hair growth? Olive oil and coconut oil is better for grey hair. I have a question about this mask and the “Miracle Hair Mask” (with yoghurt and fenugreek): you’re asking us to use “natural shampoo” after using the mask. I stopped using any kind of shampoo about 12 months ago because no matter which one I used – cheap, expensive, from salons, health stores, organic, natural – I ended up getting v-e-r-y greasy hair within 24 hours of washing, and it also gave me seborrhoea, a non-dangerous but very annoying rash on the scalp which could only be treated with a special shampoo from the pharmacist. Can I use any of these masks and NOT do shampoo afterwards? Can I for example use baking soda instead? Thank you in advance for your help. Yes absolutely, use a homemade shampoo. What natural shampoo r u recommending since castor oil makes it oily and flat? Juicing of fresh fruits and vegetables should help, like carrots, kale greens, ginger, lemon. You can add watercress, which has iodine, if you are deficient. Juicing should improve overall health also. Also, get some organic vinegar (Bragg’s) mix it with cayenne pepper and massage your scalp regularly. Apply Jamaican Castor oil to your scalp regularly. You can get it with essential oil of lavender or perhaps add your own to reduce the smokey smell. Also, take a high potency multiple vitamin daily and take at least 2 tablespoons of purified cod liver oil daily. The omega 3’s will help with the growth. A good brand that is without the strong smell and after taste is Carlson Norweigan cod liver oil. Drink plenty of purified water to improve your circulation to the scalp and absorption of your body of the vitamins and minerals. Get a picture of yourself with plenty of hair and focus on it, as you verbalize that your hair is growing back. Imagine yourself with the full hair of head that you want. This is law of attraction at work which is rooted in biblical principles. Don’t fret about it. Pray also to God and ask him to restore your hair. You also need to consume high quality protein. Jonyx- what are the amounts of Braggs and cayenne pepper and how often should it be applied and how long should it stay on? Thanks! You can use the regular castor oil. I know you said black castor oil is more moisturizing but; as far as re-growing hair is black castor oil better or is the regular castor oil better does it make a difference? Hello, in Poland you can buy castor oil only in pharmacies and I read that this one causes dryness and may be used only for scalp, so I put your mask onto hair with flax seed gel on and it feels nice and shiny. My complex problem is very oily scalp, dry ends, very thin and soft hair (like baby’s) and constant frizziness. It is never bouncy. A couple weeks ago I gave up commercial haircare and your great blog is very helpful. Sometimes my hair looks nice and sometimes not but it is never worse than it was with chemicals, so I am giving it time. My purpose is to wash it less, to balance scalp and hair and not be addicted to particular sets of shop-bought products.